A Wonderful Combination Of Flavours! I first visited Pelham House on a glorious summers day in July. Dressed to impress, a group of my girlfriends and I had booked a long table outside on their terrace ready to wine and dine our friend for her birthday. We had such a lovely day, the service was brilliant, the weather was perfect, and we took a stroll around the lush green gardens after our food. When I was invited to go for an evening review, I jumped at the chance, and my partner who had enjoyed a day in the sun at Pelham was very excited to join too. Just a short 15 min train ride from Brighton, but another destination entirely, a trip to Lewes was always fun and easy. 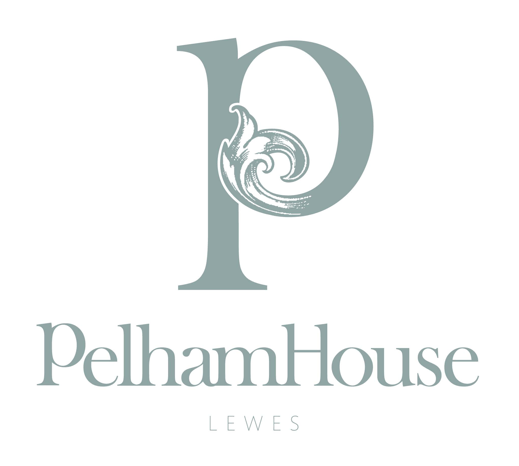 Pelham House is a 16th century historical town house just a 5 min walk from Lewes station and easy to find. The house was bought in 2004 by four different families and has been elegantly restored to provide luxurious Georgian style rooms for guests, complete with it’s own art gallery, manicured gardens, exquisite dining room, and comfortable bar and lounge. There is car parking out the front for those who drive, and there are signs pointing towards the house on the road if you are walking from the station. We were visiting on a week night evening so the house was reasonably quiet with a few people enjoying food in the lounge bar. The restaurant manager greeted us on arrival and took our coats, and offered us to take a seat in the lounge so we could enjoy a drink and start looking at the menu. There was a lovely relaxing ambience of the place, with chilled out jazz playing in the background and mood lighting. It was just what I needed after a busy day at work and we both sunk into our seats and relaxed with a smile. The barman came over to offer us a drink, so I chose us a glass of wine each – I went for a Chardonnay from the Monterey County, USA, and my partner had a South African Chenin Blanc from the Western Cape. My chardonnay was really buttery and exactly the type of chardonnay I have been chasing for a long time. It was lightly oaked, and tasted to me like buttery popcorn and salted caramel. I would highly recommend trying it if you are into that sort of wine. At £8.95 for a large glass it is more expensive than your standard wine, but you can seriously taste the quality and I would be happy to pay for it again. The Chenin Blanc was a lovely light fruity wine that tasted of stone fruits, so a great alternative as an easy drinker and my partner was very happy. As we were enjoying our drinks our waitress bought us over some complimentary deep friend stuffed olives which were served with a side of homemade dukkah. Dukkah is an Egyptian spice mix that is traditionally served in a cone with a side of greasy Turkish pitta breads for dipping. It is something that I absolutely adore, I even have my own recipe on my personal blog if you would like to try and make it at home on your own. It is usually made from sesame seeds, coriander and cumin seeds, hazelnuts, peppercorns and dried mint and it is all toasted and bashed together to form a fine crumb. The dukkah worked really well with the crumbed and Lincolnshire cheese-centred olives, and both of our tastebuds were tingling with excitement for our food that was to come. After we had finished our olives, our waitress came to usher us into the restaurant where we were seated in a corner table near to the window. 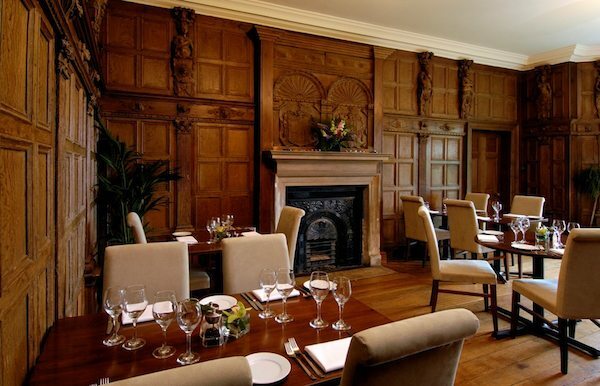 The restaurant is beautiful, with indented wooden walls with detailed statue carvings, heavy drapes framing the floor to ceiling windows, and upholstered chairs to go with the professionally set tables. The menu was of a good size with 4-5 starters and mains to choose from. 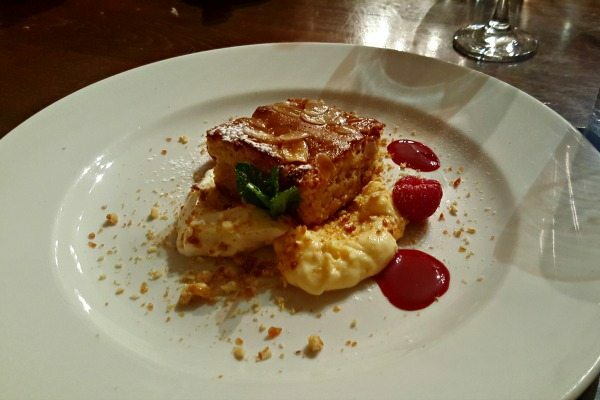 It is incredible value for the quality that was to follow, with 2 courses for £20 or 3 courses for £25. 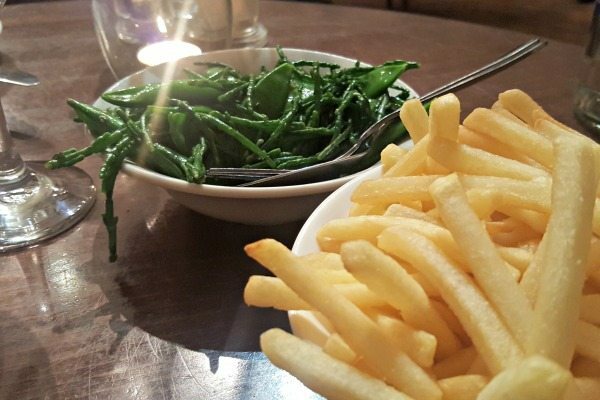 You can choose from a range of delicious sides to go with your meal at around £4.50 each too. 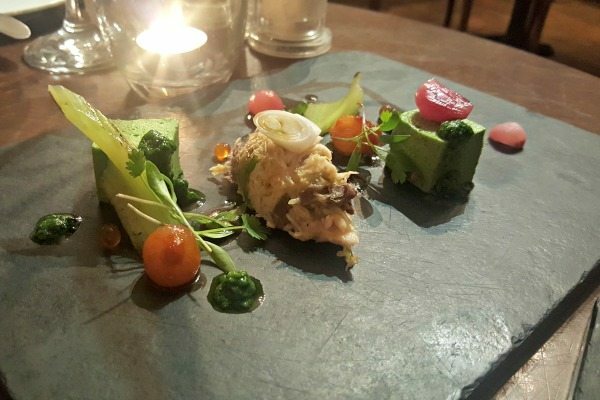 The dish is clearly labelled with the main allergens for anyone with dietary requirements and there are a couple of vegetarian options to choose from on each course. 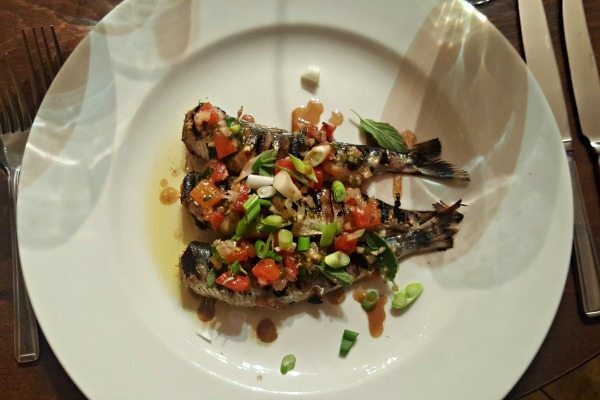 I decided to start with the grilled sardines with garlic, oregano, tomato, balsamic and olive oil, whilst my partner went for the trio of fish that consisted of a crab beignet, tian of salmon and smoked eel. While our starters were being prepared we were offered bread for the table from local organic Flint Owl bakery which was divine. They use their Millers Wheat and Rye made from organic rye flour and standard flour to give it a chewy texture and sweetness from the rye. It is made using the traditional sourdough starter method and slow fermented making it easier to digest and the texture incredible. 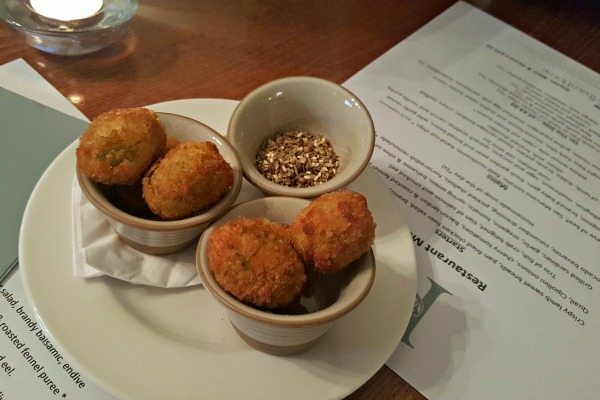 Our starters arrived and looked very appetising, They were presented simplistically but with obvious thought and care which I liked. My sardines were rich and flavoursome and had been lightly charred to give it a slightly smoky flavour to go with the fresh tomato, good quality olive oil and herbs. I could tell they were frsh as they weren’t fishy at all either. The trio of fish provided an interesting variety of textures and flavours and my partner was surprised with how much he enjoyed the eel. I think a lot of people immediately think of jellied eels when they see this on the menu, however this was not at all slimy, it was firm and sweet and very tasty and I would definitely recommend giving it a go! 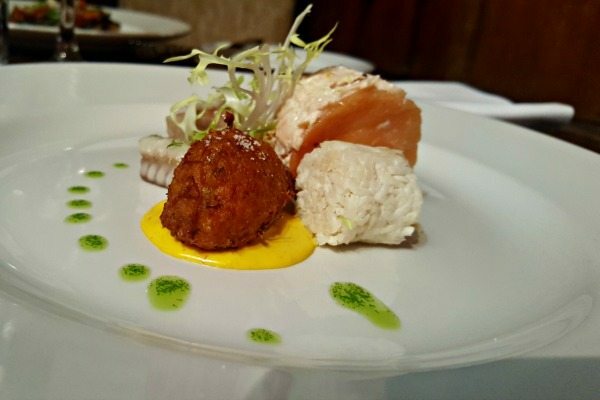 The crab beignet was lightly crumbed and deep fried to give a crunchy outside with a soft and well seasoned centre, and the salmon was soft and melted in our mouths. It was served with a celeriac remoulade and a creamy but tangy yellow aioli. 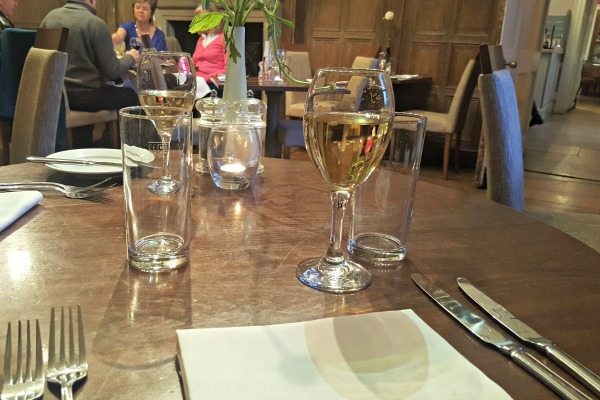 Even though the service and restaurant was set for a fine dining experience, we both still felt comfortable and relaxed and we could tell the other diners felt the same too. Our service so far had been attentive but not obtrusive and we were constantly bought or offered what we wanted before having to ask. As a surprise, the chef had prepared us a couple of other dishes to try, one from the current menu and another from a menu that was staring the day after we were there. The first one was duck breast served with confit shoulder, almonds, and grilled plums. It was all cooked very well and looked a treat on the plate. 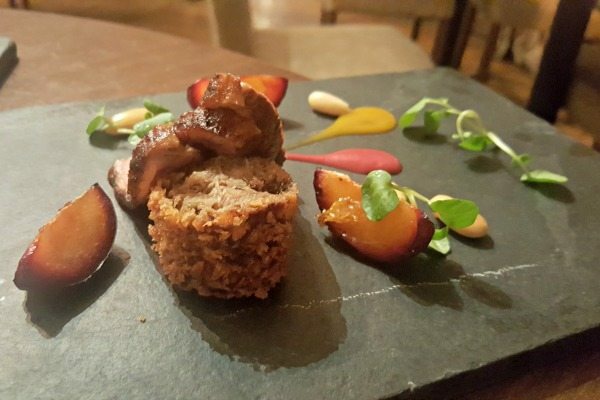 the combination of the rich duck with the sweet plums worked so well, and it was clearly made by someone who knows their flavours! The other dish consisted of crab, avocado mousse, fish eggs and red grapes. It had the perfect balance of texture and flavour and really reminded me of the harmony of these elements you would find in Vietnamese cuisine. We both really enjoyed this dish and if it is on the menu when you I would certainly recommend it! Now we were feeling rather full, but well aware we had our mains and dessert to go as well. We were offered more bread for the table which my partner accepted as he couldn’t resist, it was so good! For our mains I had ordered the lamb rack with stuffed olives and dukkah as I had to have them again, and my partner had chosen the risotto served with asparagus and a vegetarian scotch quail egg on the side. 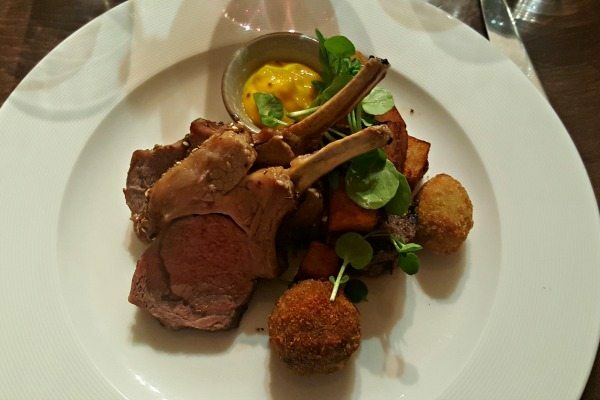 The lamb was served perfectly pink, and was served with a black pudding crispy bon bon, and cubed potatoes that were crunchy and brown with a fluffy middle. The rack was crusted with the dukkah (a fantastic pairing by the way) and the olives provided a lovely saltiness to go with the sweetness of the lamb and the braised shoulder that came on the side. The whole dish had a lot going on and was very rich, but we ordered a side of samphire and mangetout that was coated in anchovy butter and that helped to balance it out. I was in a happy place and very much enjoying the moment. The vegetarian dish that my partner had also had a good variety of textures and flavours and was the perfect portion size. 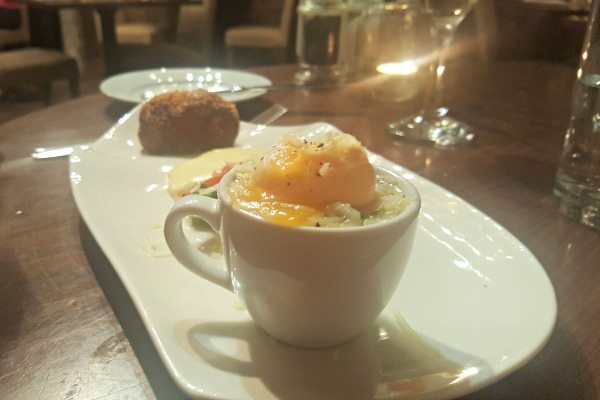 The yolk in the scotch egg was silky and runny, and the asparagus was cooked to al dente perfection and a vibrant green. We both had ordered shoe string fries as another side, which he enjoyed dipping into the yolk and creamy hollaindaise sauce on the plate. As our plates were cleared the waitress hesitantly asked if we wanted dessert after all of the food we had consumed she must of thought surely not! She laughed as we sheepishly said yes as there were a couple of things I had my eye on since the start of our meal. The dish I wanted was a gluten free orange and almond cake served with lemon curd and creme fraiche and it was so moist and flavoursome I actually did eat it all! It also came with fresh raspberries and a raspberry couli to add a sweet tanginess that I really enjoyed. 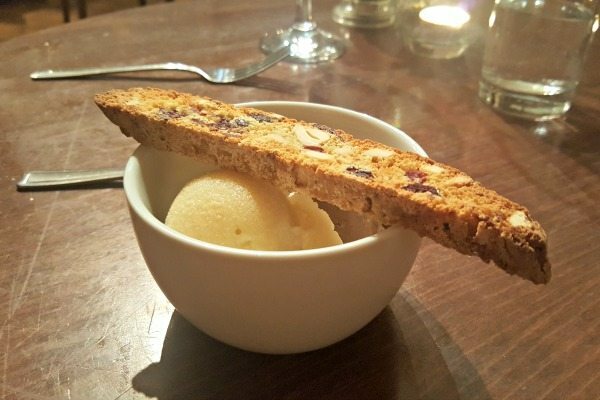 My partner wanted to try the ice creams so just had a couple of scoops in a bowl that was served with a homemade crispy biscotti on top. He was very happy. We both left the restaurant with big smiles on our face and very full bellies, and feeling nice and relaxed after and indulgent but lovely meal. If you live in Lewes or are simply visiting, I would not hesitate to recommend you visit Pelham House at all. 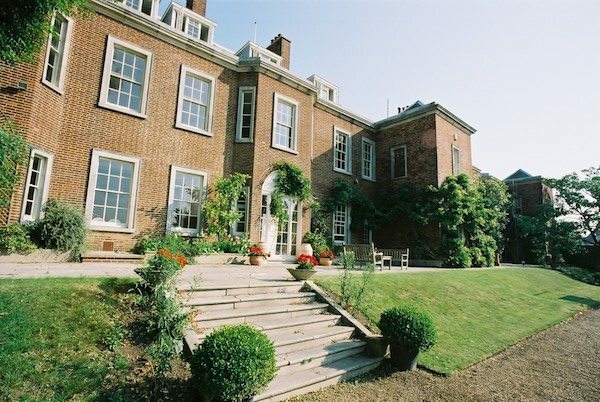 Whether it’s for a casual meal in their lounge, a special occasion in the restaurant, or an alfresco treat in the gorgeous gardens, Pelham House really is a fabulous venue to enjoy.